Michael Cohen's business card, picture source The Toggery Five 1963-1966. 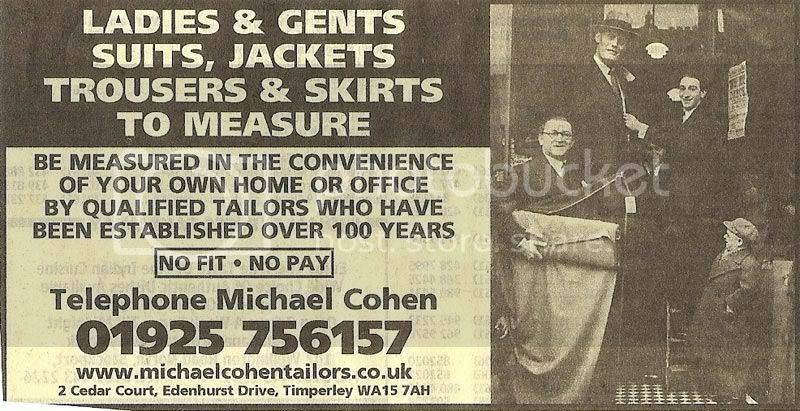 Michael Cohen is a third generation tailor. His grandfather first opened his business over 100 years ago in Oldham and Michael was brought up in the trade, acquiring skills in every aspect of tailoring. As a young man, he was working in the family business with his father - they had, by then, two shops in Oldham - and had ambitions to branch out "all by myself." MC: Well, it was a unique shop because the big window went from [ground] floor to the top of the building . . . Two floors, the window, it was a unique design and the builder, a guy called Frank Salisbury, had never done it before but he did it. I was rather surprised that he had chosen Stockport and not aimed for somewhere in the nearby city of Manchester, but Michael was adamant: "I never thought of Manchester . 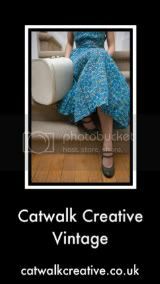 . . the shop came up in Stockport, and we thought it could be ideal." 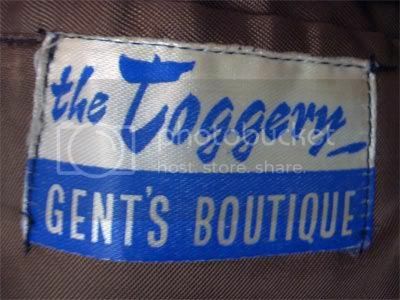 The Toggery stocked an extensive range of fashionable ready-to-wear menswear including Leslie Powell suits, Jimko (trousers and other items), Rael Brook and Ben Sherman shirts. Michael insisted on stocking only good quality brands: "I would never ever sell rubbish." MC: I remember having to go to London, had to fill my car up, to get these things . . . And at one time I had 500 pairs, paid for, which I didn't have! Me: So you didn't have them in stock? MC: Didn't have them in stock, and had 500 pairs paid for . . . So I had to go down to London and beg, steal and borrow . . . and get [them]. He also noted in passing that those boots "ruined my bloody feet!" Me: So what kind of style influences did you have, did you have anybody that you emulated or admired? MC: [Very vehement] Not at all! We tried to be unique in every way because if you bought something off the peg, off the peg was very stereotyped, so that's why I went into a lot for made-to-measure. I could make the stuff, customise what people wanted. MC: Yeah, well I think that the important thing to realise and to know is that I was lead by my customers. Whatever they wanted I got. I was working in the dark in some ways. I didn't know exactly what they wanted. But whatever they wanted, I managed to source and get, and supply them. Me: Right, so you were actually feeding off your customers' ideas really? Michael had his own workroom in Oldham for custom orders, and sourced a lot of his fabrics from London suppliers. Joe Moss noted that his "range of cloths was so impressive . . . different from anything I'd ever seen," including an "amazing range of mohairs" which were very popular then. The "ballpark figure" price of one of Michael's two-piece suits was ". . . in the region of £50" - a considerable sum at the time. He was making "30, 40 suits a week." PM: . . . if you had any trousers [that] were too long, Elsie upstairs used to alter 'em within that day and you'd come back and they'd all be done . . . Even taking in the cuffs and even tapering . . . She was dead good, Elsie . . . You come in, you bought a pair of trousers too long, you'd leave them, Michael'd measure 'em up, pin 'em up . . . or I would do that as well, cos Michael taught me all the bits I know about tailoring, well, what little of it I know . . . and I would do that, "right, there we are sir, there they are just on the top of the shoe, come back in an hour." 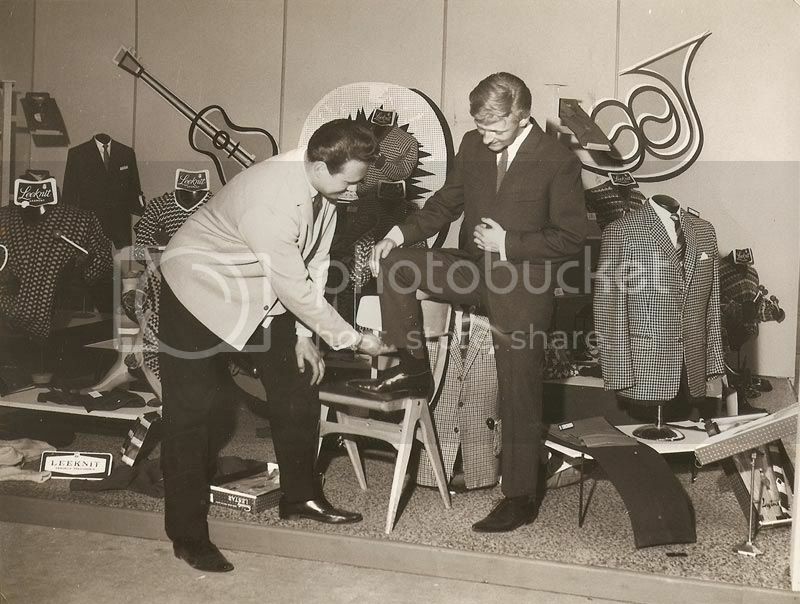 Les Machen, manager of the Toggery, points to the distinctive trouser hem of Pete Maclaine's suit at the Daily Mail International Jazz Festival, Belle Vue, Manchester, 6-9th June 1963. Pete is actually wearing a CWS suit that he was given to model, and reportedly never wore again! Photograph from Pete Maclaine. The business was thriving, and within two years the Toggery expanded into the next door premises. At the opening event to mark this expansion, Pete Maclaine and the Dakotas performed a set upstairs, interrupted mid-song by Elsie offering round cups of tea. Pete, totally unphased, took a departure from the lyrics to chorus "We all drink Typhoo teeeeaaa!" Me: Did you have a policy for who you employed? Did you try to pick cool people? MC: Well . . . basically yes. They had to fit into the environment of the premises. And have some connection and rapport with the customers. MC: No. It all kicked off really when I employed Graham Nash. And obviously he brought his friends in. Me: Was he in the Hollies then? MC: No, he was in the Fourtones . . . And then they decided to form the Hollies and it all started from there. Yeah, I made the group suits, and then other people saw them and they took me over to Liverpool to the Beatles. Me: Oh, so you went to Liverpool to take measurements and the order? MC: Yeah. In fact, I measured them first at the Three Coins in Fountain Street [this is in Manchester]. What was it, a coffee bar, was it? Graham Smith (left) and Frank Renshaw of The Toggery Five. Frank wears a leather coat made by The Toggery for Paul McCartney but never picked up. Michael's response on being told about this coat: "Well I got paid for it anyway!" Picture source The Toggery Five 1963-1966. Leather gear was a speciality of The Toggery. Michael had "someone in Ashton who used to make all my leather stuff . . . 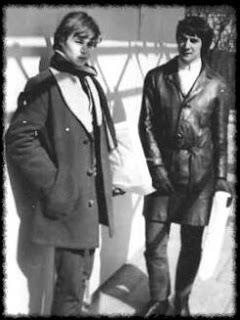 They had a leather factory there," and such an outfit might set you back about £100. In 1964 I joined local group Dean Marshall & The Deputies who later changed their name to The Lizards at a request from Pete Stringfellow who became our manager. He dressed us up in green leathers which we brought from Toggery in Stockport, all the Liverpool and Manchester groups brought their stage gear from there (so we were suddenly "cool" and "on our way"). The long list of bands and musicians that The Toggery outfitted includes - in no particular order - Brian Poole and the Tremoloes, Lulu and the Luvvers, Pete Maclaine and the Dakotas (naturally), Billy J. Kramer and the Dakotas (ouch), Gerry and the Pacemakers, Dave Berry, Swinging Blue Jeans, Wayne Fontana and the Mindbenders, Johnny Peters, not to mention celebrities such as George Best, Jimmy Savile and DJ 'Ugli' Ray Teret. No doubt there were many others too. The Rolling Stones weren't mentioned so perhaps they never called round. 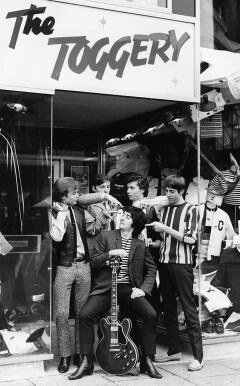 What is clear is that the shop became an essential port of call for many touring bands: "People on tours used to go in coaches, and the coaches used to stop outside The Toggery and all the groups used to come in." 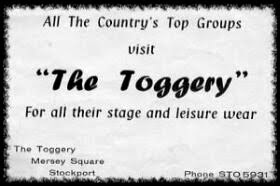 Michael Cohen soon opened two more branches of The Toggery, at Bury and Bolton - the Bolton branch benefitting in particular from its proximity to a nightclub called Cranberry Fold that "used to have all the big stars there. So I did very well." Two of those stars that Michael can recall outfitting were Tom Jones and Engelbert Humperdinck. Of course, it wasn't just down to the Graham Nash connection that Michael Cohen's business flourished. He learned from an early age about the value of generating publicity, as this recent small ad of his demonstrates. The photograph probably dates from the late 1920s or early 1930s and shows his grandfather (holding bolts of cloth) and his father on a stepladder measuring up the "tallest man in the world," Lofty, with the "smallest man in the world," Seppetoni, looking on (I have an old postcard of this pair, who used to perform in variety shows). Unfortunately, Michael talked about this when I had turned off the recorder as we were taking a tea break (lesson learned there), so I can't recall the details of this story. His concluding point was, at any rate: "Well, half of business is promotion, isn't it?" MC: I bought a double decker bus . . . to publicise everything, it was a stunt, and I wrote "The Hollies" and "The Toggery" and got [art] students to paint it. To be truthful, I couldn't get much publicity out of it, so I said to a fellow called Frank Renshaw, I said "Frank, drive it round and [attract] people," and he went under a bloody bridge! And took the top off! I've since learned that this happened on Georges Road in Stockport, which has a very low railway bridge that's still there despite Frank's best efforts. MC: Well . . . I like to think I created it. Me: Right. So you hadn't seen anything like that before yourself . . .
MC: No. They were something different. In fact, if I'm not [pause] well, I got it from a ladies' catalogue. Me: So, this was while they were still in Liverpool, was it? Before they'd actually broken nationwide? Michael's jackets were in plain black mohair, rather than the iconic grey with black trim versions by 'showbiz tailor' Dougie Millings that are so familiar. Is it possible that The Toggery got there first? Some histories of rock and pop fashion might need revising if that is the case. The Toggery story came to an end when Michael Cohen's father, Phil Cohen, who was running the Oldham family business, became ill and Michael had to attend to the shop there. He sold The Toggery sometime around 1970. There's plenty more research I'd like to do on this. For one thing, all the publicity material, photographs and memorabilia that Michael Cohen once had has been lost "in the moves," and for another the dates are sometimes a little vague. I intend to scour the local newspapers at Stockport Library for advertisements and stories (that bus caper was bound to have made the press, surely? ), and if anyone has any memories of The Toggery, pictures or even surviving garments, I'd really love to hear about it - please leave a comment, or email me. 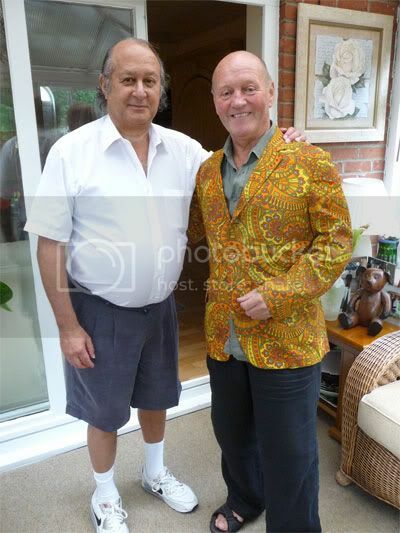 Michael Cohen with Pete Maclaine, wearing my original Toggery jacket, 5th August 2009. Michael Cohen for being such a fascinating, patient and gracious interviewee. Pete Maclaine for organising and contributing to the interview, and allowing me to use that terrific picture of himself and Les Machen. Frank Renshaw/Young for permitting me to feature his photographs in this piece. Also, I've linked extensively to the excellent Manchester Beat website, so they deserve a thank you too! This is why I love the internet and blogging and people like you. You really do learn something new ALL the time. I will certainly keep returning to this blog because I know I'm not really taking it all in yet, and it's just so good. Gosh, thank you so much! I'm immensely flattered. I can't promise I'll keep digging up stories quite as good as this one though! The more I found out about The Toggery, the more it seemed almost criminal that hardly anyone seems to know about it anymore. And if you ever come across anything with a Toggery label in it, please send me a picture or two, would you? Green leather suits, can you imagine?! Eeek! I completely missed this blog post but I'm so glad I found it. Fascinating stuff. I thoroughly enjoyed reading about them and that jacket is ultra-fab! Reminds me of something that George Harrison would have worn back in the day. Thanks so much L! George Harrison would definitely have done that jacket justice! No progress to report, I'm afraid. But I'm determined to do some more digging soon . . . Thanks for the inside story... great blog. Very late thanks goldenneedle! Glad you enjoyed the story. I doubt you'll get much traffic from here, Best Cine Tailoring Chennai, but it's always worth a try! Hello Bill! It's great to hear from an actual, real live original Toggery customer! Sounds like it was worth that long trip over. Fab blog. 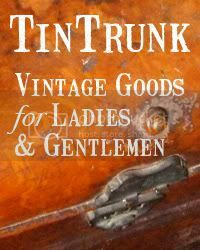 This is invaluable information to vintage collectors and I am so grateful. There just isn't enough information out there about Phil Cohen Tailors. 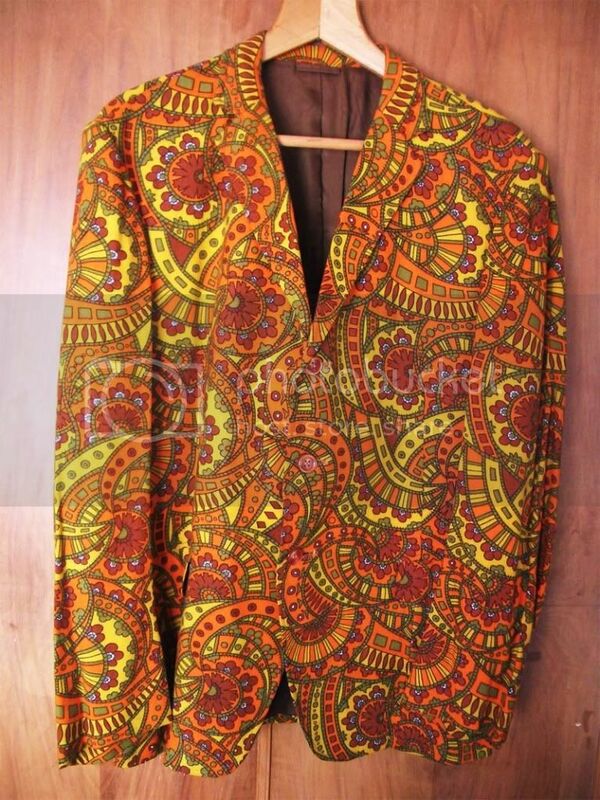 I have a Phil Cohen suit in my collection which looks unworn, it's beautiful. I love your Toggery jacket...what a gem! Hi MondoTrasho and thank you! I was lucky enough to stumble upon this story, and have the contacts to pursue it. It makes me wonder what other interesting stories there are about fashion designers and retailers outside of London, which is inevitably the focus of most fashion histories. And lucky you, having a Phil Cohen suit! Hello rattypete - it's great to read first-hand memories like yours, thank you! Fantastic article. Regarding the Beatles collarless jackets, I read somewhere that the Fab Four were responsible for their commissioning after having seen Chris Montez wearing such a jacket when they toured together. Who knows what happened in those great distant poptastic times! My Dad who is now 84, was a Painter / Decorator all his working life...... he started off the other day telling me how he had decorated the Three Coins on Fountain Street in Manchester, got invited to the opening night with my Mum and said they sat there feeling like a couple of old fogeys (they were in their 30's lol) Then he said 'look on that internet thing for The Toggery in Stockport' because it turns out he decorated that for its opening too and remembered the huge glass window. I remember The Toggery well. I used to peer longingly in the window every time I visited Stockport. It was in the early sixties and I was in my early teens. I remember pestering my mother to buy a weird striped, hairy pullover from The Toggery which I wore almost constantly thereafter.